Another highlight of this growth story is that organized retail is gaining ground. 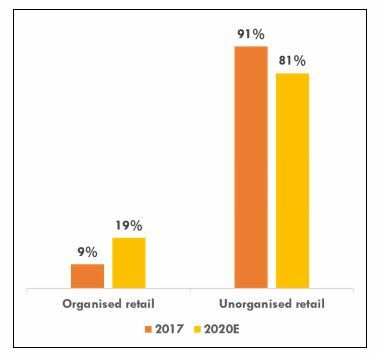 Growing significantly at a CAGR of 20-25% annually, organised retail penetration is expected to be over 10% of the total Indian retail market by 2020 as against just 7% currently. 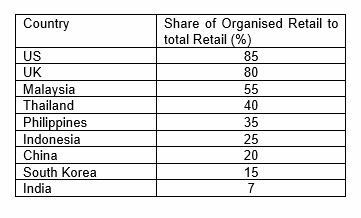 The organised retail market is estimated to increase to 19% across the top 7 cities during the same period from the current 9%. High demand for a superior customer ‘experience,’ penetration of big brands into smaller towns and cities, enhancement in business strategies and operations, along with the movement from unorganized to organized business have been key factors driving this growth. Liberalization in FDI policies by the central government has repositioned the Indian retail sector on the global map, attracting a large number of global retailers into the Indian diaspora and further fuelling the growth of organized retail in the country. The government’s decision to allow 51% FDI in multi-brand retail and 100% FDI in single-brand retail under the automatic route is the icing on the cake which has attracted giants like Walmart to make a foray into India. By easing the FDI norms in the retail sector over the past few years, the government has hit the bull’s eye. The introduction of the Goods and Service Tax (GST) as a single unified tax system in July 2017 was another major policy overhaul that is attracting foreign players. The government’s move to provide a single-policy framework for retail, FMCG and e-commerce in order to offer a level playing field to stakeholders is another step in the right direction. All in all, these policies have opened a plethora of opportunities for the Indian retail sector. Growing transparency, accountability and ease of doing business across sectors in India has given a major fillip to its potential to attract capital. In fact, it has been a major pull factor for Private Equity funding in the retail sector over the last three years. As per data, India’s retail sector attracted US$ 147.40 million investments in FY18, growing at a rate of 35 per cent year-on-year from US$ 104.34 million in FY17. Considering the future trends of Indian retail real estate, investors are showing confidence by beginning to make high-value long-term commitments towards the sector. 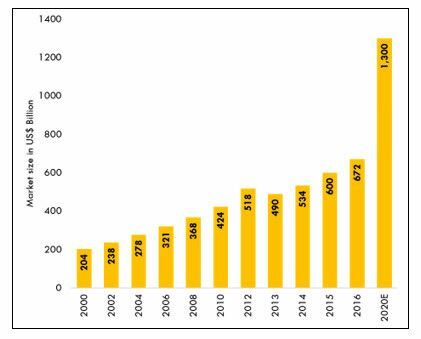 This steady rise in interest from private equity investment companies has inevitably propelled mall developers to re-vamp and re-evaluate their portfolio by including factors like product-mix, catchment and customer experience at the centre of their business strategies for malls. 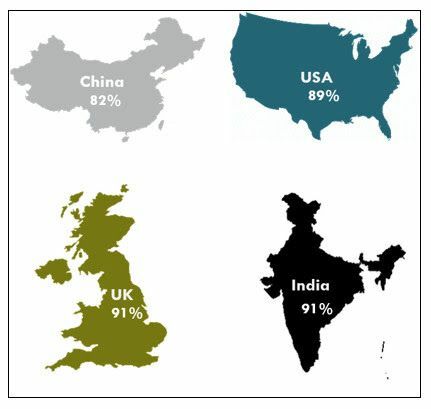 The fact that organised Indian retail is still at a very nascent stage in comparison to US (where it is 85% of their overall retail market), India thus presents a huge opportunity. Sensing immense opportunities and easy penetration into the Indian retail diaspora, overseas retailers are now expanding not just in metros but even tier 2 and 3 cities like Ahmedabad, Chandigarh, Lucknow and Jaipur, to name a few. Can Brick-And-Mortar Co-Exist with E-Commerce? From general trade to modern trade and to now going virtual, the Indian retail sector has metamorphosed significantly over the last decade. However, it is important to note that in such a large and diverse marketplace, the emergence of one format does not hamper the existence of the other. In fact, the unorganized market (personified by the ubiquitous ‘kirana’ shops) is gradually reinventing itself to catch up to the hype around modern trade. 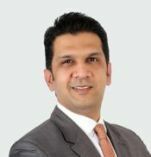 Meanwhile, large multi-format stores offering global experiences to local consumers have firmly entrenched themselves in India. While tier 1 cities were the first to benefit from the boom of organized retail, the trend has gradually permeated into smaller towns and cities due to a rapidly-evolving consumer base and its expectations. Additional factors contributing to growth here include the expansion plans of foreign brands and increasing interest of leading builders. The gradual shift in consumer shopping behaviour led to the evolution of multi-channel retail in the country. The new-age retail experience has blurred the lines between brick-and-mortar stores, social selling and online retail to some extent. Rapid digitization, the smartphone revolution and e-commerce in India have together changed the face of retail. The result is the growing popularity of multi-channel and omnichannel strategies that are redefining the retail experience. Over and above, ‘experiential’ retailing has taken precedence in the brick-and-mortar format. Besides infrastructure, amenities, catchment area and varied tenant mix, the key factor determining the success of malls in the future is its ability to offer shoppers’ an ‘experience’ which will ultimately bring them back. More so, the demand for high-quality shopping experiences is spreading its wings to tier 2 and 3 cities with the mushrooming of malls there. The market is now shifting to offer retail real estate that meets global standards and conform to the needs of global brands and investors. The mall culture dates back to the early 2000s when there were just three malls in existence in the entire length and breadth of the country. The rest was history as the shoppers gradually developed a penchant for shopping malls over the usual ‘kirana’ shops. Despite many hiccups including the recession of 2007-2008 and the onslaught of the e-commerce businesses, malls have become serious business and are definitely here to stay. 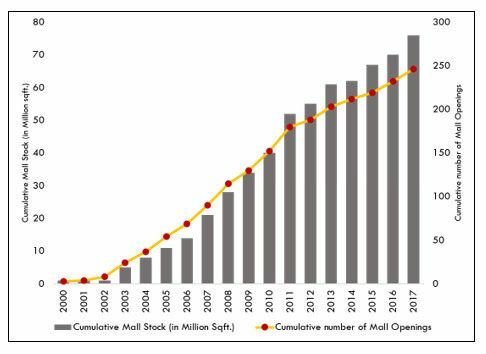 To put it in numbers, by 2017-end there were reportedly more than 600 operational malls across the country including nearly 250 malls across the tier I cities. Interestingly, more than 30 new shopping malls, covering nearly 14 million sq. ft. of area is expected to come up across the top eight cities by 2020. So, what keeps the mall culture ticking? Increasing penetration of foreign brands such as H&M, Zara, Burger King, Apple, KFC, Dior, Michael Kors, IKEA, to name a few. Various factors like design, product, diverse tenant mix, catchment area, amenities etc. play a significant role in determining the success of malls – but the most influencing factor today is the mall’s ability to provide an impactful ‘experience’ to the discerning buyers. This is also the factor single-largest factor that separates mall shopping from e-commerce. 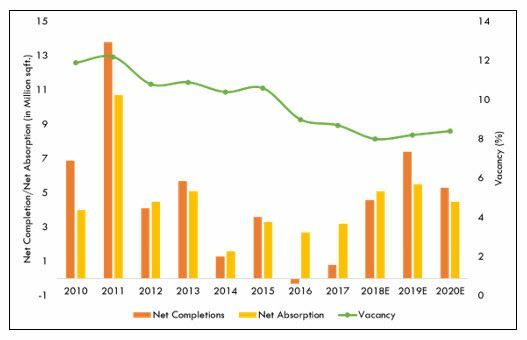 Over the past years, several developers ventured into retail space and built malls without a detailed understanding of the dynamics related to the sector. As a result, these malls failed. Today, only experienced players are continuing to venture into this segment by incorporating new-age technologies both in and outside. This is leading to the development of high-quality malls that are gradually edging out those of lower quality. Moreover, the customer is a more powerful king than ever before. Indian shoppers today are more tech-savvy, aspirational and upwardly mobile, thereby prompting retailers to adopt technology in order to engage shoppers. Besides an enduring in-store experience, faster check-out, better displays and digital trial rooms, mall operators are providing experiential retail within the mall premise. Fine dining restaurants, cafes, theme-based entertainment centres, QSRs, etc. have increasingly become popular in leading malls over the last few years. This invariably brings back customers and increases ‘mall loyalty’. Also, malls are no longer mere shopping destinations. Today’s top-performing malls are mixed-use businesses that incorporate social entertainment options, provide a unique appeal along with a certain depth in the shopping experience, and lie in prime destinations that are easily accessible by both public and private transport. Additionally, the ability to anticipate the changing consumer needs and adapt accordingly makes malls successful today. Some of the most innovative existing mall developments world-wide offer over-the-top features such as indoor ski-hills, water parks, theme parks, science centres, zoos, and shooting ranges among others. More than anything else, malls today have become brands – and to stay relevant, they have adopted new-age technologies for construction as well as to increase footfalls. Some of the leading malls in NCR that offer a unique experience to consumers are in Noida and Greater Noida. DLF’s Mall of India, for instance, has an indoor ski-range – Ski India. The Great India Place, popularly known as GIP, has a water park and one of the best kids play zone in Noida – Worlds of Wonder and Kidzania. The Grand Venice Mall in Greater Noida is a tourist destination with a Venetian concept and offers gondola rides, rendering a distinctly European feel. Other prominent malls include DLF Promenade, Select City, DLF Cyberhub in Gurgaon, and Ambience Mall and DLF City Centre, Chandigarh which are doing exceptionally well. The second-largest mall in the country in terms of area, World Trade Park in Jaipur has a unique display feature wherein 24 projectors create a single image on its ceiling. If we move down south of the country, Lulu International Mall in Kochi, touted to be the largest mall in the country, is using technology to offer a differentiating experience. It is using new-age technologies like geo-fencing, beacon technology and Automatic Number Plate Recognition (ANPR) to interact with its customers and keep them abreast on the latest activities within the mall. Another case in point is Phoenix Market City in Bangalore and Chennai, a marquee development in retail real estate space that has established itself as a lifestyle and entertainment destination. The mall offers a holistic and premium experience for retail, entertainment and movies, and F&B. Buoyed by the phenomenal success of malls across the metros, tier 2 cities like Trivandrum and Mangalore have also welcomed the mall culture in their city with the former seeing the launch of Mall of Travancore early this year. The western region of the country too, has seen significant success in their mall story. MMR is home to some of the most iconic shopping centres including High Street Phoenix, Infinity mall, among others. India is today one of the fastest growing e-commerce markets worldwide, with millions of new internet users taking advantage of cheap smartphones and high-speed data. According to recent market research, mobile-phone internet user penetration in India is projected to reach 37.36% of the total population by 2021. This represents a huge potential in terms of digital and mobile buyer audience. Additionally, overall internet audiences in India are estimated to surpass 635 million online users by 2021, thus, paving way for increases in online shopping. As per estimates, online retail is projected to grow to US$ 73 billion by 2022, growing at a CAGR of 29.2% to the backdrop of a shift from traditional retail to online channels by millennials. In fact, e-commerce in India is growing faster than in other countries like Australia, Japan, China and South Korea. Besides increasing internet penetration, other factors contributing to the rise of online retail include a young population aided by easier access to credit and payment options, high-speed internet, 24-hour accessibility and convenient and secured transactions, among others. Realising the potential of online retail, retailers are also luring customers by offering products at discounted prices especially in the consumer durables sector. Options like cash-on-delivery and manufacturers’ warranty have added fuel to the fire. Cash-on-delivery has become the most preferred payment option with over 30% of buyers opting for it in India. The government’s plan to allow 100% FDI in e-commerce, under the criterion that all products sold must be manufactured in India, aims to gain from this liberalised regime. Thus, the online retail business is a New-Gen format which has a high potential for growth in the near future. After conquering physical stores, retailers are now foraying into e-retailing in a big way. Besides having physical stores, they are also shifting focus on online formats so as to lure buyers. With the advent of e-commerce in India, shopping converged into mobile devices in the form of websites and/or apps. At the click of a button, one could buy just anything from groceries to apparel to electronics and almost anything else. For a while, it appeared that ‘couch potato shopping’ was gaining prominence and that e-commerce will eventually disrupt the entire brick-and-mortar business. However, this is not entirely true. While it did cause some disruption, it was not enough to have a significant and lasting impact on the conventional retail formats. Initially, the heavy discounts offered by e-commerce sites lured buyers and impacted malls that registered a slight dip in the overall footfalls and sales. Consumers came back to malls as they missed the holistic retail experience. Moreover, they saw that malls are no longer just shopping destinations but places where they can unwind and get entertained. With the discount seasons becoming a vogue even across malls, shoppers are all geared up to feel the experience whether in malls or in the virtual world, as per their convenience. How things will unfold for malls in the times to come remains to be seen. The changing business environment, favourable policy shifts and the entry of numerous global players indicate that a resurgence of shopping malls in India is definite. The need of the hour is to develop good quality malls that can attract occupiers for the long-term so that the entire value chain of the retail sector benefits. A clear measure of increasing focus on the retail sector is that private equity (PE) players and wealth funds invested over US$800 million in Indian retail market in 2017. As it was, quite a few badly-conceived and executed malls did fail. That said, one lesson learnt is that there is a distinct need for developing multi-channel retailing rather than just relying on the traditional methods. Meanwhile, the fact that online biggies like Amazon and Alibaba are investing in offline stores indicates that brick-and-mortar business is not going anywhere in spite of the ‘online assault’. When customers want an experience, they come to stores. Thus, online and offline retail have started working together in one ecosystem. Omnichannel Retailing: The Future of Retail? To define it, omnichannel retailing is a fully-integrated approach that provides shoppers with a unified experience across both online and offline channels. It extends from brick-and-mortar locations to mobile-browsing, e-commerce marketplaces, onsite stores, social media, and everything in between. Most omnichannel retailers have a physical as well as digital presence and provide seamless, effortless and high-quality experiences to consumers. 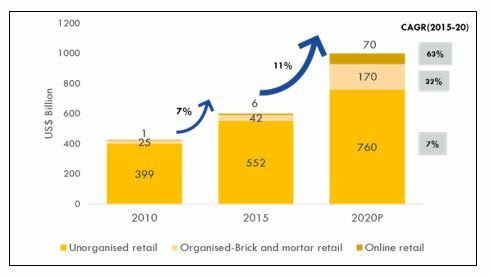 So, is omnichannel retailing really the future of retail in India? The answer may not be a simple one. However, if we consider the consumer trends, it does seem so. Several retailers today are using various channels to convert their leads into loyal customers. In fact, they seek to establish a conversion point at every step of the customer’s journey. This could be on handheld devices in the form of an app, online, in kiosks, or in a brick-and-mortar store. Thus, to be successful, a business needs to utilize every available channel and provide a seamless and consistent user experience. There are multiple reasons why omnichannel retailing could be the future of e-commerce. Retailers are betting big on factors like customer personalization, better data on customer behaviour and maintaining a consistent brand image. Besides enabling customers to access brands from anywhere they are, omnichannel retailing values the consumer experience above all else while being able to track data and provide even more tailored solutions moving forward. Over and above, for omnichannel to be successful, most brands are making things simple and more accessible to customers, without any confusion. This is paving the way for omnichannel retail to carve a niche for itself in India – and the world over. Retailing today is definitely more than just mere brick-and-mortar, and retailers who are agile enough to adapt and revolutionize their way through changes will continue to grow and thrive in the future. Besides technological advancement and digitization, the future of retail will see diverse business ecosystems blend together not just to deliver the best to their consumers, but to gain a competitive edge over the others as well. As a result, retailers will expand their horizon, seize more opportunities and create their own unique ecosystem that will eventually provide a more thriving shopping experience for discerning customers.